Nope! I’m not going to get it. No way! Rather than give in to the ‘dark side’ and upgrade my cell phone to one of the fancy-smancy, figgle-dy piggle-dy versions that can launch apps (and nuclear missiles out of Nebraska), I’m going to keep my cheap flip phone from 2001. I know, it’s so ‘yesterday’ to actually talk to someone instead of telling them that ‘FCOL MYOB YOLO 420’ (I’m pretty sure I just ordered pizza…maybe.). These new little fancy Galaxys, Razors and iBananas (or whatever) are amazing. But we’re starting to create rules and legislation to deal with these little wafers of communication. 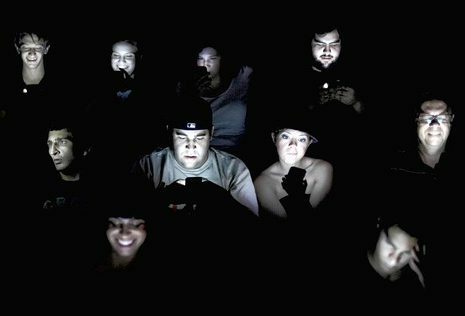 Notice how movie theaters now spend at least 60 seconds of precious preview time to instruct the audience that by turning their phone on in a dark theater will be like turning on an arc welding machine in a cave; our retinas will be permanently scarred and leave us blind, groping around in everyone else’s popcorn bucket. Apparently, these special devices could replace the plessor used by physicians to check a person’s knee reflexes during a physical. The doctor simply holds the girl’s phone to her knee after requesting that the girl’s ‘BFF’ send her a text; her pulse rate could be measured by having her pull up a picture of Daniel Sharman and gaze at it longingly; her temperature could be measured by telling her that her younger brother was looking at her online diary when she left it on the kitchen counter. My wife swears by them, but she gets frustrated when she sees those pesky signs that communities are starting to put up nearby school zones. You know the ones that state that if you’re texting, looking at or even thinking about your smart phone while driving through a school zone, you might as well head over to the police sub-station and turn yourself in. This is troublesome to Maggie because she’s still trying to get around the whole ‘reduce speed’ requirements in said school zones. Ever since she downloaded that ‘Punk Kid’ app that allows you to earn points for trying to run down jay-walking truant kids showing up to school over an hour late, she’s been itching to go hunting. Points can be turned in for items like a driver-side magnetic door score card, bumper cleaner or a laser targeting system HUD for the windshield. To the kids’ credit, and if their phone is still working, they have learned how to schedule an appointment with their attorney. The new phones can be locked, but how hard is it, upon finding a stray phone laying around, to look at the skin oil pattern and unlock it? I once did that with a phone I found in the library. While I did spend a bit of time advancing the owner ten levels on Candy Crush, I eventually took it to the lost and found area and got rid of that vile device of the netherworld. To top it off, I happen to be checking out when the owner claimed his phone. He was furious that someone had been poking around his files and had fiddled with his Candy Crush. The nerve of some people. Oh, I suppose the new whistles and bells of the new phones do make life somewhat simpler. When I started flying more extensively than I do now, it sure would have been nice to have an s4 and be able to live my life out of the palm of my hand. Can these phones make a veggie omelet? No! Can they jump my car battery when I forgot my jumper cables? No! Can they record a blockbuster movie in Blue Rey quality in a dark theater so I can be the first to post it to YouTube before the movie actually premiers? Well, actually, that would be kind of nifty come to think of it.